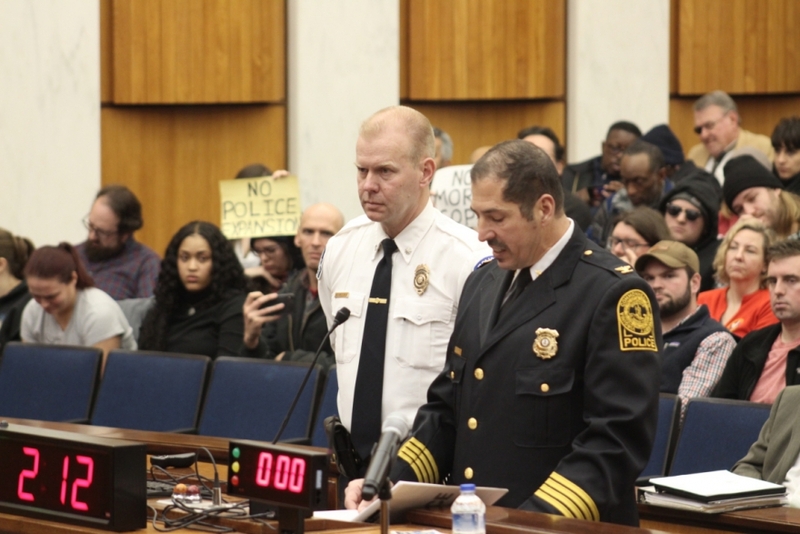 Richmond Interim Police Chief Will Smith, left, and VCU Police Chief John Venuti, right, discuss jurisdiction expansion while protestors hold up signs in the gallery Monday night. Richmond City Council took on a number of hot button issues Monday night, from Coliseum redevelopment to the prohibition of bike lanes on a popular Northside road. City council members also voted to move forward with a plan to legalize electric scooters on public roads, a plan that has the backing of e-scooter businesses. The new law will allow a company to put up to 500 scooters on the streets that can be used between 5 a.m. and 9 p.m. Although the e-scooter ordinance was approved 6-3, Councilwoman Kim Gray said she has reservations about the city being held liable for accidents involving these e-scooters. “We are all trying to do what’s popular and not always what’s best or safest for our citizens,” Gray said. Council Vice President Chris Hilbert also opposed the bill, saying e-scooter companies like Lime and Bird disrespected the process by dumping the scooters in Richmond before trying to work with the city. City Engineer M. Khara told the council that Richmond administrators were also concerned about the issue of liability. Khara said there will be strict safety requirements on e-scooter companies, including a 15 mph speed limit on the devices. Asked whether or not the e-scooters would compete with the city-owned bikeshare program, Khara said the bikeshare’s advantages -- 24/7 accessibility and reliable docking station locations -- would ensure it remains popular. State law also prohibits e-scooters from being ridden on the sidewalk. Perhaps the most controversial topic at the late-night Monday meeting was VCU Police Department's jurisdiction expansion into areas of Jackson Ward and Shockoe Bottom. About a dozen residents and VCU students attended Monday’s meeting to express concern over how more policing could negatively impact minorities in these neighborhoods. An impromptu recess was called when Councilmember Reva Trammell questioned why race was a part of the conversation, drawing vocal backlash from the audience. The council returned and quickly approved the expansion 7-2. A prohibition on bike lanes on Northside’s Brook Road was also defeated as bicyclists formed a line out of the door of council chambers to speak in opposition. The proposal, which was backed by councilmembers Kim Gray and Chris Hilbert, failed 6-3. Councilwoman Gray repeatedly expressed concerns about how a two lane road could lead to congestion, impairing delivery trucks and first responders. But Jakob Hembolt, pedestrian, bicycle and trails coordinator for the city, said city planners believed bike lanes would not slow traffic below a level acceptable for a residential road. Resident David Ramirez, who said his family rely on their bikes for doing grocery shopping or going to the doctor, said prohibiting bike lanes on the road sends the wrong message to pedestrians. “I think it’s important that we express to these individuals that they are safe and valued, because at this point Brook Road is not safe,” Ramirez said. Also of note: An amendment that would have allowed the Navy Hill Development Advisory Commission to seek input from experts living outside of the city of Richmond was defeated 5-4.